Brossard, QC. 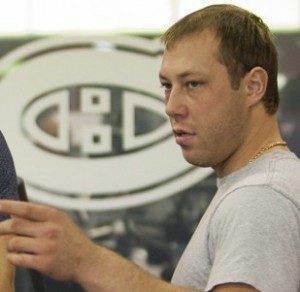 — On Saturday, Alexei Yemelin was introducing himself to Canadiens fans and his teammates by leveling any member of the opposing team in the intersquad game. He showed no mercy for a certain young forward still recovering from a concussion and fractured vertebrae. Max Pacioretty was on the receiving end of at least two solid hits by Yemelin including a hip check that sent number 67 spinning. Does it sound like Pacioretty is less than thrilled about continuing to be asked about the hit two days after it happened? You will recall that on Day Two of training camp the offensively gifted Brendan Gallagher dominated the game and was the toast of Montreal. Which brings us to Monday morning, time for the final scrimmage with Team B led by Brian Gionta facing Andrei Kostitsyn’s Team C.
Right out of the gate it seemed like Pacioretty wanted a piece of the headlines nailing Gallagher into the boards only seconds after the puck drop. Despite giving away four inches in height and 35 pounds, Gallagher ensured the debt was repaid before the end of the shift. The two renewed the acquaintaince several times during the game. The competition between Gallagher and Pacioretty was a rare bit of physicality in this game that was noticeably less intense than the previous two scrimmages. Perhaps the minds of the players were on the impending roster cuts and the first pre-season game. The changes were evident off the ice too as the parking lot was much less full and there were a few more wisps of grey in the stands. The Bell Sports Complex fans showed their appreciation for P.K. Subban when he stepped on the ice — it was his first training camp action after nursing a back injury. Subban acknowledged with a wave. 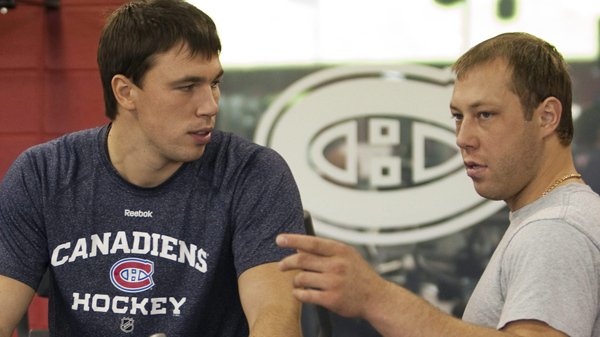 But the two most intense competitors on the ice on this day were Gallagher and Pacioretty. Gallagher had an exceptional second period helping his Team C to a 4-2 victory. Pacioretty saw plenty of ice-time on a line with his buddies Philip Desimone and Aaron Palushaj. Desimone has outplayed the more experienced Palushaj, demonstrating his play-making abilities throughout rookie and training camps. Pacioretty scored the final goal of the game for Team B.
Ben Winnett had opened the scoring for Team B with his third goal of the training camp. Nathan Beaulieu scored his first for Team C which earned him a P.K. face wash. Gabriel Dumont netted the hat trick for Kostitsyn’s squad which went 2-0 in the tournament. The Habs bench boss is correct, Brock Trotter is another young player deserving praise after this game. After a year in the KHL, he seems much improved particularly his skating. He may be one player Habs management is considering for an open roster spot along with Palushaj. But the odds on favorite for a promotion has to be Andreas Engqvist who has been impressive playing on a line with Gallagher and Andrei Kostitsyn. After Peter Budaj and Nathan Lawson each surrendered a goal in the first period, Robert Mayer and Peter Delmas came on for Teams B and C, respectively. Mayer and Delmas are both goaltenders who play deep in their net — Delmas has a tendency to go down early, while Mayer has lost his confidence. They are problems that can be fixed but with Canadiens goalie coach Pierre Groulx focusing on his reclamation project named Budaj, will he have time for the necessary jaunts to Hamilton? Canadiens coach Jacques Martin stated today that Budaj is an upgrade over last year’s backup Alex Auld. Budaj certainly has the potential but how much effort will it take and does it come at the expense of two young Hamilton goalies who are in obvious need of guidance? Bulldogs fans must be fretting at the thought particularly after being spoiled by one of the best tandems in the AHL last season in Curtis Sanford and Drew MacIntyre. The Canadiens will play their first pre-season game at the Bell Centre on Tuesday night when they host the Dallas Stars.